I think this might be the longest we’ve gone without a newsletter. But in that time we have made it through so much discombobulation including a crazy election year and inauguration down south, a plethora of full moons, huge and magnificent additions to our Board of Directors including a new Chair, Sandrine Lafond (forever thanks to Diana Kolpak, founding Chair, for her wonderful years of service), crazy weather, and most recently the ides of March. And on we go. Yay!!! CREATIVITY and the ARTS!!!! It seems human rights, liberty, truth, democracy (not really sure what that is anymore), grace and basic human decency, and of course all of The ARTS are under attack from so many pretend leaders. Real leaders take us somewhere good and new. I’m referring to these silly folks who are not leaders but rather defenders of systems and a lifestyle that has long ago been proven unsustainable, flopping around on the ground like so many dying fish (insult to fish not intended) miles from the water, frantically and pathetically grabbing at anything in their sights in the false hope that somehow their fear and greed can be sustained indefinitely. But do we shrink away? Not as far as I can tell. It seems this has simply been a call to action, a rising up. When have we needed creativity, humour, insight, enthusiasm, hope, and love more than now and who rises to the occasion? So away we go! This will be the 15th summer of classes on Manitoulin Island. Come and work and play and send all your friends. The fireflies are getting their last days of rest before thrilling us again in June and July. I’d be surprised if the August meteor shower didn’t show up. The deer, the rabbits, the pheasants, the foxes, the coyotes, porcupines and skunks are all in abundance and ready to go. Here is some news from associated artists and alumni and work that has in some form or at some stage of development blessed this remote initiative for creativity and performance. Important immediately is Karen Hines’ “Crawlspace” which goes up March 23rd at Soulpepper in Toronto. https://www.soulpepper.ca/performances/crawlspace/2007. Karen worked on and did early readings of “Crawlspace” and her other fantastic new show “All The Little Animals I have Eaten”, here on Manitoulin and they rock. Coach House Books has just published them together under the title “Animals” https://chbooks.com/Books/A/Animals/. And while we’re on the topic of Karen Hines, she is returning this year for her ever-popular “Neo Bouffon” course from September 6-10 – all info at http://www.manitoulinconservatory.com/course-descriptions/#bouffon. If you are in Vancouver for the last week of April through the first week of May catch “Mump & Smoot in Anything” happening at The Cultch’s York Theatre https://thecultch.com/events/mump-smoot-in-anything/. Following the Mump & Smoot run John (Smoot) will be teaching a Mask and Clown Intensive (Baby Clown) in Vancouver from May through Axis Theatre so if you know anyone there that interested send them to: http://www.axistheatre.com/professional-workshops/. If you happen to be in Albuquerque, New Mexico March 24th or 26th you can catch “The Island”, created and performed by Kenn McLeod & Jed Tomlinson as part of Tricklock Theatre’s 17 Annual Revolutions Festival. http://www.tricklock.com/production/the-island/. After the wonderfulness of turning themselves inside out at Mike and John's Joey & Auguste workshop last summer Morro and Jasp are returning to Manitoulin in April to work with John in an early development phase of their new show. "Morro and Jasp are in search for meaning and create their own religion in an attempt to make sense of it all." So keep your radar tuned in for "Morro and Jasp in Stupefaction". Sizzle and Spark will be hitting the road this fall with their new show “Hushabye”. The show was chosen by Canada's three clown festivals (Montreal, Toronto, and Edmonton) to participate in the inaugural Canadian Clown Festival tour. Montreal Sept 13-17 www.mtlclownfest.com, Toronto Sept 21-24 http://www.torontofestivalofclowns.com/about-the-festival/, Edmonton Sept 28-Oct 1 www.playthefool.ca. Jennifer Dallas's "Kittly Bender" had a great run at the Theatre Centre in January. It was a wonderful exploration of the crossover between clown and contemporary dance. Keep your ear to the ground on this one, as it is certain to continue to have life. 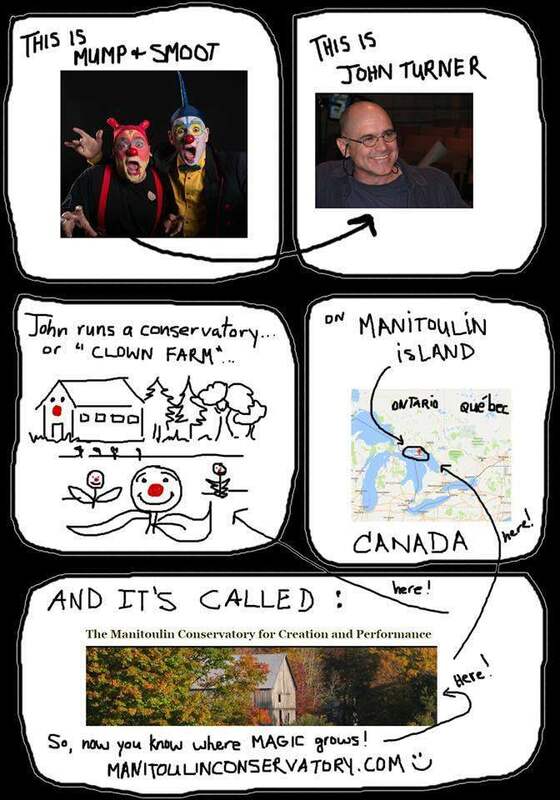 And last but not least, if you happen to be on Manitoulin Island this summer for Canada Day be sure to get to Gore Bay and keep a watch for a few alumni clowns performing as part of the Canada Day celebrations there. Feel free to pass this newsletter on to everyone and remember that we are a charitable foundation and will give you a tax receipt for any donations, all of which currently go to our scholarship program supporting those dedicated artists with limited funds. This entry was posted in Announcements, Newsletters. Bookmark the permalink.